Sturgeon’s law [is] named after its originator, science-fiction author Theodore Sturgeon, who once observed, “It can be argued that 90% of film, literature, consumer goods, etc. is crap.” The “It can be argued” part usually isn’t quoted, and the figure is very ballpark. But it’s inarguable that the majority of what comes down the pike, in any medium, is mediocre or worse. It would be tiresome for critics to constantly be counting the ways that the work under review is crap, nor would their editors and the owners of the publications they write for be happy with a consistently downbeat arts section. The result is an unconscious inclination to grade on a curve. That is, if something isn’t very good, but is better than two-thirds of other entries in the genre—superhero epics, quirky or sensitive indie films, detective novels, literary fiction, cable cringe comedies—give it a B or B-plus. [C]ritics fall prey to a sort of hermeneutic Stockholm syndrome. They experience so much bad work that they get inured to it. They are so thankful for originality, or for a creator’s having good or arguably interesting intentions, or for technical proficiency, or for something that’s crap but not crap in quite the usual way, that they give these things undue credit. All of that rings true, especially the “grading on a curve” and “hermeneutic Stockholm syndrome” lines. (Those are good — wish I’d thought of them.) I say that not just as a uniform critic but also as a former rock critic, a former restaurant critic, and an occasional design, book, and movie critic — but especially as a uniform critic. There are soooo many designs, and so many of them are either crap or just taking up space with no particular reason for existing. It can be exhausting, or at least numbing. I’m not proud to admit this, but sometimes I do find myself sort of instinctively grading on a curve. Why do I find myself doing that? Part of it, for sure, is that I don’t want to be perceived as being relentlessly negative. But I think a bigger part of is that I don’t want to be relentlessly negative. That’s the drag about being a critic: You spend a lot of time being, well, critical. And although I realize it probably seems like I enjoy being a nay-sayer, it’s actually no fun. It’s much more enjoyable to be positive about things. The problem, as noted by Sturgeon’s law, is that most things don’t deserve a positive response. So while I try to maintain certain standards and benchmarks, and try to be true to my aesthetic convictions, there are times when I feel myself bending a little. Not that I’m complaining, mind you. I’m just saying that the gig does have its downsides, and that there are days when it definitely feels like hard work. It’s all good food for thought. Thanks for listening. As a p.s., if you’ve never visited WishbookWeb, I highly recommend it. Tons of holiday catalogs, and you’ll see a whole lot of NFL gear from back in the day, just like the above-linked Packers stuff! A real treasure trove. • Baseball program cover art doesn’t get much better than this 1973 Oakland A’s scorecard, which commemorates their World Series title from the previous fall. Notice Joe Rudi on the bottom left of the cover — I happened to be sitting just above the left field fence when he made that catch during the bottom of the ninth in Game Two. We initially didn’t know if it was a home run since the ball dropped right in front of us, but I quickly saw that the other side of the stands weren’t cheering, so I knew he had caught it. A sad day at Riverfront. Yes, I’m still bitter. • This is a 1970s Philadephia Flyers “Flyerjak,” made exclusively for The J.C. Penney Co.
• Here’s another one of those great 1970s Fleer NFL Big Signs — this one is for the Jets, but I’ve seen the source photo, and it’s definitely Bengals defensive back Tommy Casanova, who wore No. 37. • This DIY NFL helmet blanket is covered with individual patches of the various teams and is very nicely done. • Ah, the classic 1980s/1990s Dallas Cowboys Starter jacket. I got one of these for Christmas from the program director of my Top-40 station — he was a Cowboys fan too, to the extent that our station van was blue/silver, and so were our staff jackets! He always denied that was the reason why, but we knew better. • I sure would love to see the San Francisco Giants wear these late-1970s orange throwbacks on a regular basis. • Technigraph helmet plaque alert! This one is for the Detroit Lions. The seller has five other teams up for auction, too. • Wow, check out this really nice 1970s Damac Seattle Seahawks poster by Chuck Ren. • More brilliant NFL poster art, this time a 1960s poster for the Denver Broncos. • And from reader Jeff Flynn, this game-used The King and His Court softball uniform is probably outside most Uni Watch readers’ price range but is still worth looking at. What a beauty! Got an item to include on Collector’s Corner? Send any submissions to uniwatchcollectorscorner@gmail.com. Thanks! Contest reminder: In case you missed it last week, our latest ESPN design contest is to redesign the Jaguars. Full details here. Baseball News: The Twins appear to be the latest MLB team moving to matte helmets and 3-D helmet logos. … UT-Arlington’s softball uniforms appear to be based on the 1986 Mets design (from Jason Hendrix). … New softball uniforms for the U. of Washington. … Last week new Tigers skipper Ron Gardenhire said it might take him a while to learn everyone’s name, and that he might therefore be referring to a lot of players as “Hey, Buddy.” So yesterday a bunch of players showed up wearing “Buddy” NOBs (from Steve Vibert). … Brewers mainstay Ryan Braun, making the shift from OF to 1B, says he’ll have to start wearing a cup for the first time in over a decade (from Mike Chamernik). … New blood clot softball uniforms for Florida Southern College (from Wayne Koehler). … New Padres free agent signee Eric Hosmer will wear No. 30 as a tribute to his former Royals teammate Yordano Ventura (from Mike Chamernik and Brady Phelps). NFL News: What’s worse than logo creep? Double logo creep! 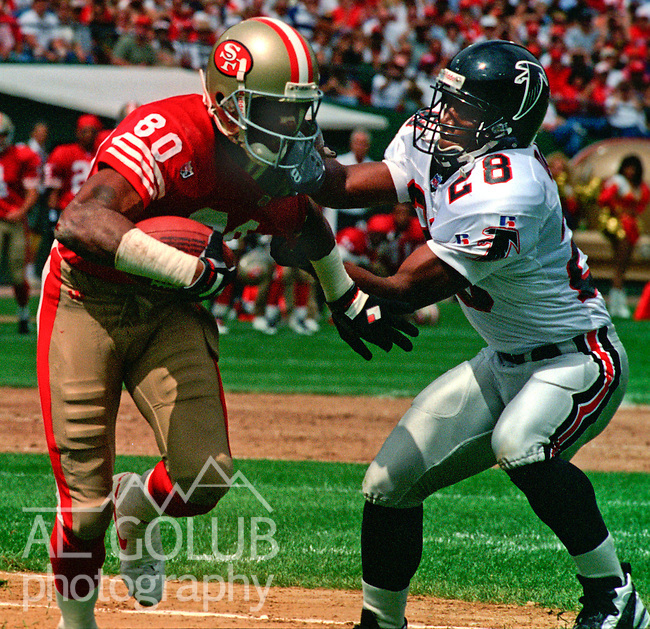 That’s Falcons DB Ron Davis with the dual Russell Athletic logos on his left sleeve in a 1995 game against the 49ers (good spot by Johnny Garfield). Hockey News: “My son plays in an adult hockey league at the UPMC Lemieux Sports Complex in suburban Pittsburgh,” says Paul Wood. He named his team the Mighty Yuks and designed the jersey in honor of my neighbor, Dr. Richard Moriarty, the pediatrician who conceived and created Mr. Yuk symbol in 1971.” This photo shows Dr. Moriarty wearing the Mighty Yuks jersey, accompanied by Paul’s son. … The Panthers responded to the Florida school massacre by adding helmet decals and jersey patches. … Canucks G Anders Nilsson has a rainbow icon on his mask’s backplate to promote LGBTQ rights. … Olympic figure skater Mirai Nagasu used to work as an ice girl for the Avalanche (from Kary Klismet). … The Golden Knights wore white at home last night. Olympics News: Really good piece on Olympic Zamboni drivers (NYT link). … American skier Lindsey Vonn has a 48-star American flag on a piece of her gear. “I couldn’t find any other photos of that particular piece of equipment on other athletes to see if it’s unique to her,” says Bryan Grupp. … Last week we linked to a New York Times story about American curler (and my pal) Tyler George using the same pair of ratty sneakers for eight years. The story generated so much feedback that the Times took him shopping and bought him new footwear, which sounds really sketchy from a journalism ethics perspective. … Tyler has also been wearing a series of flashy socks (thanks, Phil). … If figure skaters and ice dancers just wore a unitard and a number like all the other athletes, instead of ridiculous costumes, they wouldn’t have to worry about the type of “wardrobe malfunction” that a French ice dancer experienced on Monday. … The rest of these are from Kary Klismet: American freestyle skier Gus Kenworthy was wearing owl-themed mittens<?a> during the slope-style competition. If you have a LinkedIn account, you can see more info here. … Reprinted from the hockey section: American figure skater Mirai Nagasu used to work as an ice girl for the Colorado Avalanche. … In a related item, Nagasu generated a lot of chatter by wearing kinesio tape on her inner thigh. Grab Bag: NASCAR driver Austin Dillon and his crew celebrated their Daytona 500 win by getting “Champ” tattoos on their butts. … Apple is seeking a new trademark for its rainbow-patterned logo. … New Rugby shirts for Germany. Jesus christ, I feel old now. The Sabres also wore white at home yesterday. They wore their Winter Classic uniforms. That put the Capitals in their home reds. With all the red jerseys in the crowd the Sabres just helped it look even more like a Washington home game. Should a uniform get a passing grade if it performs its basic functions of (1) permitting the players to play and (2) easily identifying the team and player, even if it’s otherwise hideous? A “passing grade”? Well, that could be as low as a D, right? Sure, I’ve given a “D” to plenty of hideous but arguably functional uniforms (I say “arguably” because I think part of a uniform’s function is to be non-hideous). 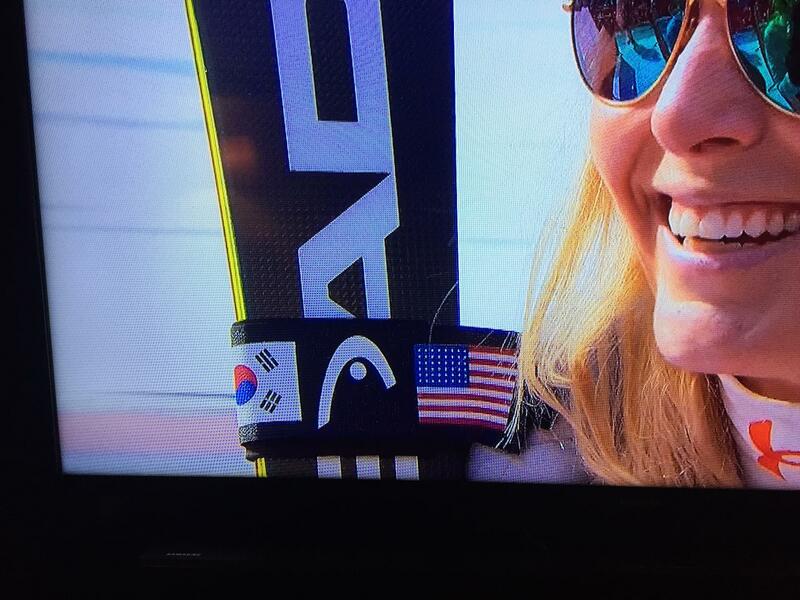 It looks like skiers using Head brand skis have a wrap/band with the Korean flag and their home country flag. Norway example below. Not sure why US flag was made with 48 stars. ??? For the record, any past number and configuration of stars remains a “valid” U.S. flag forever. So while a 48-star flag on modern athletic equipment is odd, it’s not wrong. I’m wondering if the 48-star was intentional because that was the flag at the time of the Korean War? No part of the flag should ever be used as a costume or athletic uniform. However, a flag patch may be affixed to the uniform of military personnel, firemen, policemen, and members of patriotic organizations. I’m pretty sure that exists solely for people to come up with creative new ways to improperly display the flag. I’m pretty sure the worst I’ve seen was on the field prior to some sporting event, the flag was cut in the shape of the contiguous states. – The flag should never be carried flat or horizontally, but always aloft and free. – The flag should never be used as wearing apparel, bedding, or drapery. It should never be festooned, drawn back, nor up, in folds, but always allowed to fall free. Bunting of blue, white, and red, always arranged with the blue above, the white in the middle, and the red below, should be used for covering a speaker’s desk, draping the front of the platform, and for decoration in general. – The flag should never have placed upon it, nor on any part of it, nor attached to it any mark, insignia, letter, word, figure, design, picture, or drawing of any nature. – The flag should never be used for advertising purposes in any manner whatsoever. It should not be embroidered on such articles as cushions or handkerchiefs and the like, printed or otherwise impressed on paper napkins or boxes or anything that is designed for temporary use and discard. Advertising signs should not be fastened to a staff or halyard from which the flag is flown. – No part of the flag should ever be used as a costume or athletic uniform. However, a flag patch may be affixed to the uniform of military personnel, firemen, policemen, and members of patriotic organizations. The flag represents a living country and is itself considered a living thing. Therefore, the lapel flag pin being a replica, should be worn on the left lapel near the heart. While it’s true that sports teams routinely violate the flag code (while claiming to honor the flag), let’s please remember that the flag code has no force of law, has no enforcement mechanism, would be shot down on First Amendment grounds in approximately two seconds if anyone ever tried to enforce it, and is basically a suggested code of etiquette that everyone is free to accept or reject as they please. The ‘Mighty Yuks’ hockey jerseys is another example that could go in that article you linked to recently about the (mis)use and longevity of hazard/warning symbols. So, if it’s Staubach’s arm, whose legs are they I wonder? Good catch. the “E” version is correct. Incorrect version now fixed. It is nice that Hosmer is paying tribute to Ventura; that was a terrible tragedy. I have not seen anyone report along with that, though, that he had to change numbers since 35 is retired for Randy Jones. The University of Minnesota introduced new uniforms in a team meeting this morning. New helmets feature massive oars down the middle (reflecting P.J. Fleck’s “Row the Boat” obsession/mantra) and the gold chrome helmets mean they now have lots and lots and lots of different uniform combinations. Not a fan of the “Row The Boat” mantra. So any school that hires Fleck will have to deal with this? This isn’t a Minnesota tradition, this is a PJ Fleck thing he brought from Western Michigan. If he wants to continue preaching it, fine, but don’t put it on the uniforms. So should Clay Helton put “Faith, Family, Football” on the USC helmet? I’ve been wondering how Gopher fans feel about this guy sticking his “row” thing everywhere. It’s funny you brought up USC, as an SC alumni I would be pissed if he came in an tried to replace “Fight On!” I know he’s not trying to replace Ski-U-Mah but it looks like he’s trying to put it on equal footing, not right. From a fellow Trojan and Uni-Watch reader, we’ve been pretty fortunate not to join the BFBS or any other fade, at least in football. Pathetic. I’ve heard the story of how P.J. Fleck came to adopt “Row the Boat” as his personal mantra, and it includes some heartbreaking elements to it, to be sure. But taking that phrase from being a form of individual inspiration and shoehorning it onto the uniforms of every football team he winds up coaching strikes me as an exercise in personal vanity and selfishness. As for the rest of the uniform elements? Major downgrade from their previous set. If it isn’t stroking Fleck’s ego, it’s promoting Nike to the exclusion of anything that resembles the culture and tradition of the University of Minnesota. Which, by definition is, bad design. Shame on Fleck and Nike. And shame on Minnesota for letting them get away with it. taking that phrase from being a form of individual inspiration and shoehorning it onto the uniforms of every football team he winds up coaching strikes me as an exercise in personal vanity and selfishness. I don’t disagree. But I think it also reflects something I’ve brought up before: the extension of “branding” into, well, everything. Behold P.J. Fleck’s “personal brand,” which now takes primacy over the team he supposedly serves. Being a Wisconsinite, I am predisposed to hate anything Gopher related… that said, that gold & anthracite combo is honestly, truly ugly. The maroon, white & gold combos are fine and are their colors. But wow-bad for the gray and yellow. “I’m gagging and vomiting at the same time! I’m — gavomiting!” – My reaction to that release. I don’t even want to think about that “name” for that new uniform model. It comes of as something trying to appeal to ten-year-olds. Proofreading: “Golden Knighs” in the hockey section should be “Golden KnighTs”. Golden Neighs with a dramatically-flowing mane logo… There you go, that one has to be trademark-proof. One of the things I struggled with in college was writing film criticism for classes and reviewing movies for the student paper. Similar but different skill sets. Paul, I was expecting you to mention some uniforms you regret rating too high on a curve. Sending up a flare from the rabbit hole that is the Wishbook Web. If anybody can hear or see me, please explain to my bosses why I won’t be getting any work done today. My dad has a King and his Court jersey somewhere. I showed him That and asked him about it. He says he did some work an a guys car locally that he played softball with, who had been signed on to play for the team, and his payment to my dad was a jersey. It’s a blank back jersey, and I believe it’s been attacked by moths over the years in the closet. But the guy told my dad it was One of Eddies jerseys. Dad doesn’t believe that, and well probably never know. At the time Eddie was about at the end of his career. I’m going to confess it, right here: I do NOT like the matte helmet in baseball. Furthermore, I’m thoroughly unmoved by the 3D logo…sorry fellas. The matte helmet works for me for some teams. Not the Twins. I think it has to do with the dark navy color. Royal and black, the matte helmet makes it look like a wool cap or an old flocked helmet. For whatever reason, dark navy matte helmets don’t have that effect for me. They just look like unfinished, dirty helmets. The 3D logo thing, at first I thought it would only work for single color/layer logos. Then the first two-color logo with a simple shape and outline came out in 3D and it looked OK, and I thought it wouldn’t work for more complex logos. All along, I sort of thought that the Twins’ TC was a logo that just wouldn’t work in the 3D format. And yet I find that I rather like how the 3D TC looks after all. …for me, I think I have been conditioned over the years to appreciate how the batting helmets reflect the stadium lights and sunlight (not in that vulgar ‘chrome’ way), thus becoming some minuscule piece in the way I perceive the ‘flavor’ of an experience at the ballpark. The matte helmets look dirty to me or ‘dead’ in some meaningful aesthetic sense. The 3D logo is pure “meh”. I’ve found myself unexpectedly surprised with how well the matte helments have been working. I’ve been expecting not to like them only to later find that I do (After all, black reflecting light can only be so black). That being said, that first photo of the Twins matte helmet is not a good look. I’ve always liked how Minnesota’s helmet reflects juuuuuust enough color to show that it isn’t black under the lights. Take away the gloss and you take away that reflection. Again, that photo doesn’t help. Maybe it will look better on a player? There’s a helluva difference between 90% and 50%+. There’s a helluva difference between “crap” and “mediocre or worse”, especially when the terms used are inexact. That said, hang in there and don’t “bend” your standards too much. “Grading on a curve” and “hermeneutic Stockholm syndrome” also explains a lot of bad relationships. Nice NFL kids unis on that JC Penney catalog page. All the helmets look great EXCEPT the Eagles; those wings are terrible. Has anyone mentioned that the uniforms for Friday’s NBA Rising Stars game appear to be based on Clippers (Buffalo Braves) and Lakers (MPLS) throwbacks? Lindsey Vonn was planning to atke her grandfather to the Olympics. The last time he was in Korea was the war. Unfortunately he passed away. Perhaps that explains the flag.